With such a helter-skelter preparation coming into the tournament, Equatorial Guinea unintentionally headed into the tournament as a classic Rumsfeldian unknown unknown. Their path into the tournament and recent change in coaches meant little was known about their players, team selection or tactics. Not even a South American football journalist fraudstering their way as an African football journalist could have claimed total knowledge about this team. Fail to prepare, prepare to fail, as they say. And with such shambolic tournament conditioning it’s safe to say many made the understandable assumption that they would lack organisation and cohesiveness as unit, or if they’d resemble anything close to a unit. Yet, before they visibly tired towards the end of the game, Equatorial Guinea, particularly through the pace of Middlesbrough’s Emilio Nsue and the nippy pair of Javier Balboa and Iban, posed a consistent threat to Congo’s backline. Congo had an awful first half and, though their second attacking substitutions helped, they didn’t really get into the game until Equatorial Guinea’s fitness issues crept in. But what was particularly galling was the continuing disorganisation in defence for a side managed by one of Africa’s astute tacticians. The high defence line was regularly breached in the first hour, when Nsue’s fitness was somewhere near its optimum, and the game may have been over had Nsue’s legitimate goal not been disallowed. This defence nearly cost Congo qualification and more potent, pace-filled teams are forthcoming. In attack, they were reliant on set-pieces and there was little quality before Thievy Bifouma’s explosive spell in the latter stages of the second half. There was little to excite the neutral in this Congo team, whether it be in attacking endeavour or, for the cynical, stubborn defending. Modern day footballers can’t simply just be footballers; they must also have the fitness levels to go in tandem with the technical proficiency. For all the technically adept players in their ranks, Equatorial Guinea’s players showed they lacked the endurance for full games. The games flow quickly from here on in so there is little time for Equatorial Guinea to improve their fitness levels drastically in the coming days. In Burkina Faso and Gabon, Esteban Becker’s men will be facing two of the fittest teams in the tournament. The former were renowned for their recovery time in the 2013 edition whilst the latter’s youthful athleticism and number of players plying their trade at a good standard also means they should be able to pose a danger for the duration of games. There is a phenomenon of reading too much into one result in these tournaments, especially the result of the opening game. The hype-o-meter of winning teams either goes off the scale or, at the opposite end, obituaries are written on the losers. Often, there is no middle ground. Perspective seemed to have been lost after Burkina Faso lost 2-0 to Gabon, despite the numerous chances the Stallions created. There were those who said Aristide Bance is no longer good enough, as if he was good enough in the first place (sorry Aristide, as much as I love you). There were those who said the Stallions lacked the surprise factor now. There were some who alluded to them lacking the killer instinct. Bar isolated cases of handing out good old fashioned thrashings to some teams in qualifying over the last year, this has never been anywhere near a vintage, all-conquering team. As widely mentioned, they reached the 2013 AFCON final despite only winning one game over 90 minutes. Whilst the attack is more refined than it was two years ago, the finishing can be hit and miss; they still lack an out-and-out top class striker. The 2-0 scoreline suggests it was a comfortable victory for Les Pantheres but it was anything but. They were cut open several times by the Burkina Faso attack, with Bruno Ecuele Manga, Yrondu Musavu-King and Didier Ovono doing much of the last-second scuppering. Did they show enough defensive solidity to indicate that they can go far in the tournament? To some extent, but their midfielders will need to be far more disciplined against better teams. Didier Ibrahim N’Dong, one of SFG’s midfielders to watch at this year’s tournament, was slow to track his runners and over-eager in his tackles, Levy Madinda, except for his assist, was largely unwise with the ball and also neglected his defensive duties. This left the defence exposed and a team with quality finishers would have been able to take advantage of some of the situations that were presented to Burkina Faso. Was there enough for opponents to fear? Absolutely. 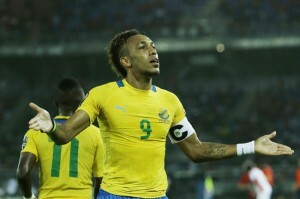 Pierre-Emerick Aubameyang, Malick Evouna and Frederic Bulot were by no means at their optimum level, but there were glimpses that they had the pace and quality to cause any side in the tournament problems. If conventional creativity is lacking, then, with the collective pace – in speed and thought (though Evouna doesn’t seem to understand the offside rule – amongst them, a goal is always just seconds away.